This is “Introducing the Realm”, section 7.1 from the book Regional Geography of the World: Globalization, People, and Places (v. 1.0). For details on it (including licensing), click here. Summarize the basic geography of Subsaharan Africa. Identify the African Transition Zone, including the transitions that are occurring in the zone. Locate the main features on a map. Understand how early kingdoms flourished in Subsaharan Africa before the colonial era. Identify how selective groups in these kingdoms participated in the supply operations for the slave trade. Explain how European colonialism divided up Africa and the role the Berlin Conference played in the colonization process in Africa. Outline how countries have transitioned from colonies to independent nations, including the many issues involved in this transition. There is considerable variation with respect to how the regions of Subsaharan Africa are delineated or identified on maps. The debate is not about what regions are in Subsaharan Africa but rather about which countries are to be included within each region. The regions have both similarities and differences. The cultural geography varies widely from country to country and from one ethnic group to another, but at the same time, there are shared cultural patterns across all Subsaharan African regions. For example, colonialism has been a major historical factor in the shaping of the countries. Families are large, and rapid rural-to-urban shift is occurring in all regions. Every region has large urban centers—often port cities that act as central core locations supported by a large peripheral rural hinterland. Globalization has entered into the dynamics connecting these once-remote regions with the rest of the world. Advancements in communication and transportation technology have created networks connecting Africa with global markets. Subsaharan Africa has a young population that is on the move, seeking to gain from any opportunities or advantages it can find. The political arena is dynamic: changes in political leadership through coups or military takeovers are common, as is authoritarian rule. Subsaharan Africa is home to some of the poorest countries in the world. Poverty is evident in the countryside and in the urban slums of the largest cities. Bitter civil wars are a part of every region’s history. Violence and conflicts continue in some areas, while other areas exhibit political stability and thriving economies. The diversity in human geography is the most noteworthy dynamic in Subsaharan Africa. The variety of ethnic groups along with the multiplicity of languages and religious affiliations create strong centripetal and centrifugal forces that interact in a thriving sea of cultural diversity. Most of the population lives an agrarian lifestyle, but there are people who are developing the skills necessary to adapt to the rapid globalization wave that is importing new technology and new ideas to the continent. The urban core areas of the continent are the main focus of the global trends in technology and communication. These urban core areas exhibit the typical dynamics of the core-periphery spatial relationship. Subsaharan Africa has many core areas and many peripheral areas. The core urban centers have political power thanks to the social elites who have connections to the global economy and often dominate political activities. To help identify places discussed in this book, Africa has been divided into regions along traditional boundaries. Source: Updated from map courtesy of Andreas 06, http://commons.wikimedia.org/wiki/File:BlankMap-Africa.svg. These core urban areas are often magnets for people from large families in rural peripheral areas seeking employment. Millions of people in Africa who seek employment are willing to migrate to the cities or even other countries to find work. The rural immigrants are often not of the same ethnic group as those in power, which sets up the basis for discriminatory policies that disadvantage the many minority groups that are not affiliated with the government. These dynamics can fuel protest activities with a goal of overthrowing the powerful elite. Various ideas have been proposed to help level the socioeconomic playing field. One of the more prominent options is the implementation of a democratic government, where most of the people have a stake in electing those that hold positions of leadership and power. Broad patterns and dynamics of people and places are replicated throughout the Subsaharan realm. The regions share common demographic trends of large family sizes, agrarian lifestyles, and low income levels. The patterns of an economy based on agricultural production and mineral extractive activities as well as disruptive changes in political leadership are common throughout the continent. Each region has diverse ethnic groups and an array of different languages. South of the African Transition Zone, the most prevalent belief systems are Christian based and animist, while north of the zone, Islam is widespread. Division and civil unrest can occur where the different religions meet and compete for political control. These concepts will bear repeating throughout the chapter. The cultural mosaic of Subsaharan Africa is vast and complex, and this chapter will outline the basic trends and patterns with specific examples that will help place it all in perspective. 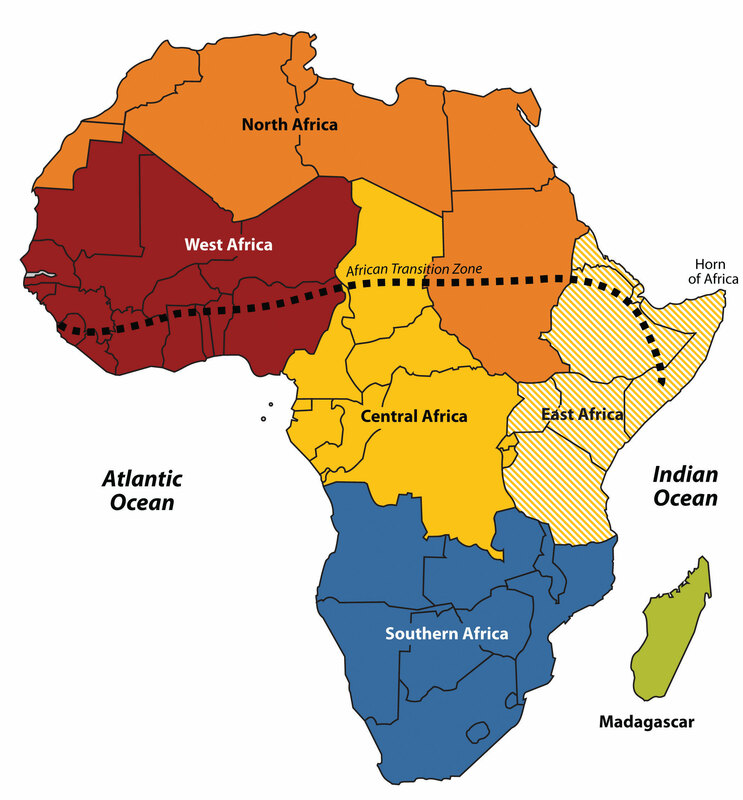 The African Transition Zone divides North Africa from the rest of Africa because of climatic and cultural dynamics. Cultural conflicts and desertification are common in the zone. Dry, arid type B climates, common in the Sahara Desert, are dominant north of the zone. Tropical type A climates prevail south of the zone. Global climate changes continue to shape the continent. The shifting sands of the Sahara are slowly moving southward toward the tropics. Desertification in the zone continues as natural conditions and human activity place pressure on the region through overgrazing and the lack of precipitation. Type B climates resurface again south of the tropics in the southern latitudes. The Kalahari and Namib Deserts are located in Southern Africa, mainly in the countries of Botswana and Namibia. For a continent as large as Africa, Subsaharan Africa does not have extended mountain ranges comparable to the ranges in North or South America, Europe, Asia, or Antarctica. There are, however, on the Ethiopian Highlands the Ethiopian Plateau that reach as high as 15,000 feet in elevation. East Africa has a number of well-known volcanic peaks that are high in elevation. The tallest point in Africa—Mt. 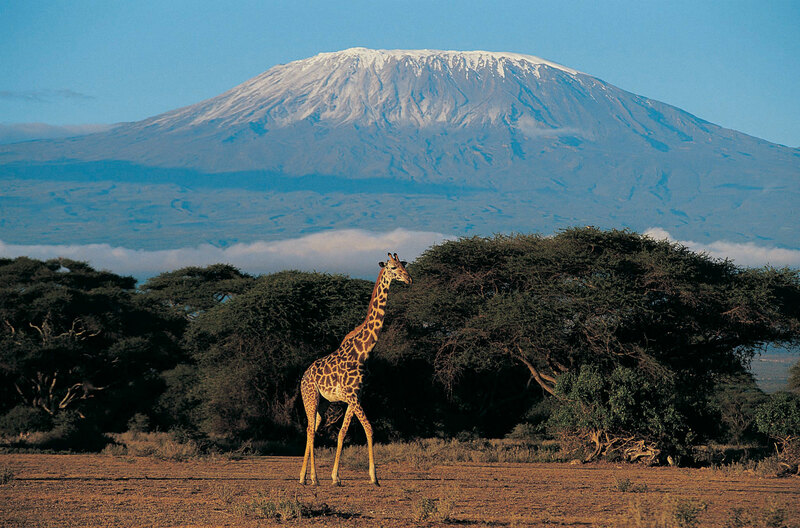 Kilimanjaro in Tanzania near the border with Kenya—is 19,340 feet high. Nearby in Kenya, Mt. Kenya is 17,058 feet high. The Rwenzori Mountains on The Congo/Uganda border reach more than 16,000 feet in elevation and create a rain shadow effect for the region. Permanent glaciers exist on these ranges even though they are near the equator. On the western side of the continent, Mt. Cameroon in Central Africa is more than 13,000 feet in elevation. The South Africa’s Cape Ranges are low-lying mountains no higher than about 6,000 feet. The continent of Africa consists of basins and plateaus without long mountain chains. The plateaus can range more than 1,000–2,500 feet in elevation. The only continuous feature is the eastern rift valleysLarge fault zones in the eastern region of the African continent caused by shifting tectonic plates; long valleys surrounded by higher elevations or plateaus are created. 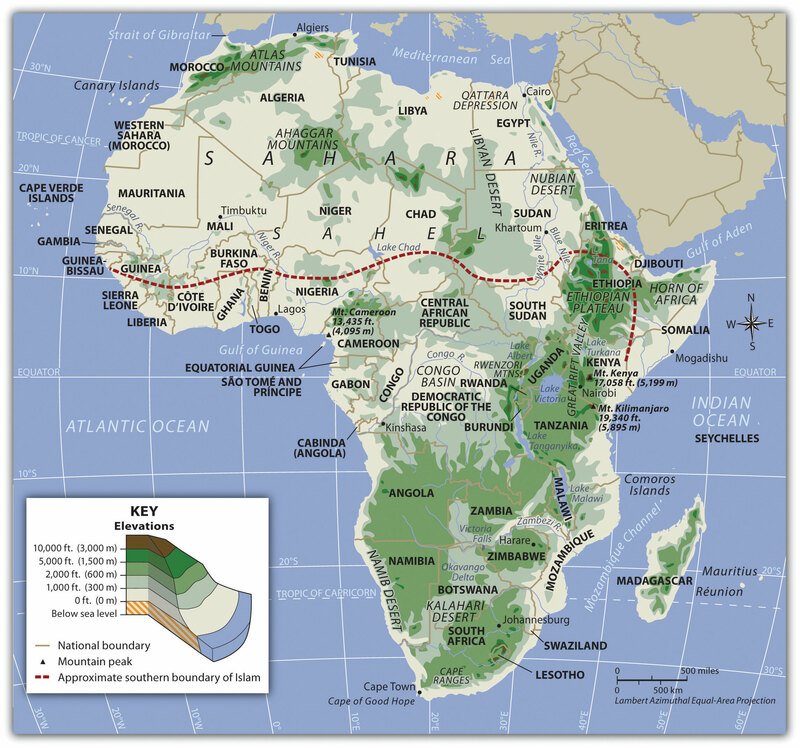 that run along the tectonic plate boundaries from the Red Sea through to South Africa. Africa has many scenic areas and many national parks set aside as game preserves, which have become major tourist attractions for world travelers. The main rivers of Africa include the Nile, Niger, Congo, and Zambezi. The Nile River competes with the Amazon for the status as the longest river in the world; the White Nile branch begins in Lake Victoria in East Africa, and the Blue Nile branch starts in Lake Tana in Ethiopia. The Niger flows through West Africa; its mouth is in Nigeria. The Congo River crosses the equator with a large tropical drainage basin that creates a flow of water second only to the Amazon in volume. The Zambezi River in the south is famous for the extensive Victoria Falls on the Zambia and Zimbabwe border. Victoria Falls is considered the largest waterfall in the world. Other significant rivers exist such as the Orange River, which makes up part of the border between South Africa and Namibia. There are a number of large lakes in Subsaharan Africa. The largest is Lake Victoria, which borders several East African countries and is considered to be the second-largest lake in the world in surface area. Only Lake Superior in North America has a greater surface area. A number of large lakes are located in the rift valleys of the east. Three of the largest lakes along the western rift are Lake Malawi, Lake Tanganyika, and Lake Albert. To the northeast of these in Kenya is Lake Turkana, which reaches to the Ethiopian border. Lake Chad is located in the African Transition Zone on the border between Chad, Mali, and Nigeria. Lake Chad has been severely reduced in size in recent years. The equator runs through the center of Subsaharan Africa, providing tropical type A climates. These regions usually have more rainfall, resulting in lighter, leached-out soils that may not be as productive as regions with richer volcanic soils, such as those found in the rift valleys. Root crops are common in Africa, as are millet and corn (maize). The savanna regions of the east and south have seasonal rains that affect the growing season. Soils in savanna areas are usually not as productive and cannot be depended on to fulfill the agricultural needs of growing populations. Savannas are usually grasslands or scrub forests with a seasonal precipitation pattern. Cattle and livestock grazing are common in savannas, and migrations are frequent to follow seasonal grazing conditions. In specific areas of Southern Africa, larger farming operations exist in type C climates. However, Subsaharan Africa is not blessed with the large regions of rich alluvial soils found in the Northern Hemisphere. The ever-growing agrarian population has always depended on the land for food and sustenance, but these conditions are not favorable for Africa’s future. Populations are growing faster than any increase in agricultural production. Increasing populations in Subsaharan Africa are taxing the natural environment. Where the carrying capacity has been exceeded, the natural capital is being depleted at an unsustainable rate. Deforestation is occurring in areas where firewood is in high demand, and trees are cut down faster than they can grow back. Expanding human populations are also encroaching on the natural biodiversity for which the African continent is renowned. Large game animals such as rhinoceroses, elephants, and lions have been hunted or poached with devastating consequences. The creation of game preserves and national parks has stemmed this tide, but poaching remains a serious problem even in these protected areas. Gorilla and chimpanzee populations have also been stressed by human population growth. These animals are being killed by humans for bush meat, and their habitats are being reduced by human activities. Subsaharan Africa does not have long mountain chains such as those found in the other continents. The Nile, Congo, and Niger Rivers are the main waterways. The Namib and Kalahari are the main deserts south of the African Transition Zone. The Great Rift Valleys are the longest physical features in East Africa. West Africa was home to a number of large empires that shaped the culture and people of present-day Africa. Gold, salt, copper, and ivory were important early trading commodities. Mining and acquiring these items brought enormous wealth to the region. Slavery became a component in the warfare between groups, as the winner usually took the captives to serve as servants or slaves. The Ghana Empire (790–1076 CE) was responsible for one of the early consolidations of power in West Africa. Though its power and wealth were vast, it was only the first of a number of empires to arise in the region. 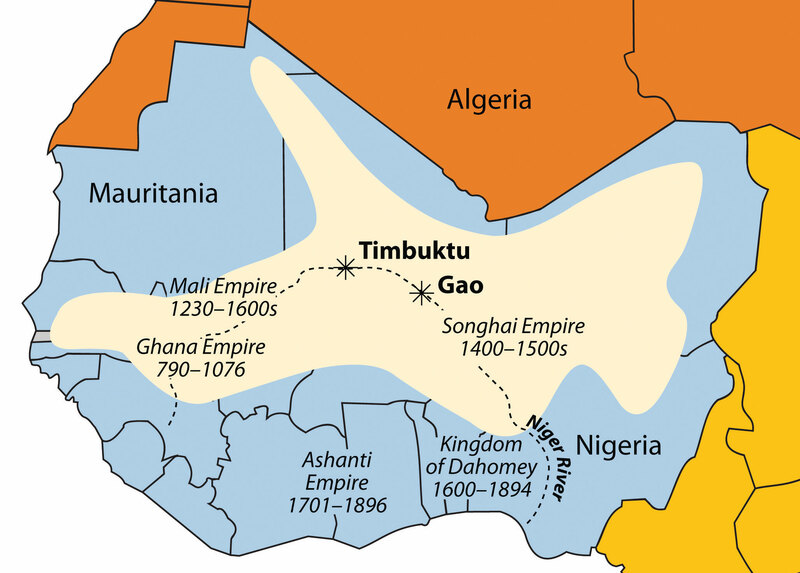 After the Ghana Empire came the Mali Empire (1230–1600 CE), which was known for its wealth and size. The empire held major mining operations including gold, copper, and salt. Expanding along the Niger River and to the Atlantic coast, the Mali Empire extended over an area the size of Western Europe. Originally a federation of local groups, the empire incorporated many smaller provinces or kingdoms and had a major influence on the region’s laws and cultural heritage. The Niger River and the main empires of West Africa are indicated on this map. The shaded region indicates the furthest expanse of the Songhai Empire at its peak in the sixteenth century. One of the indigenous states that evolved out of the Mali Empire was that of the Songhai people, who were located to the east of the main Mali Empire. The Songhai had been based around the city of Gao for centuries, and in fifteenth century, they established the Songhai Empire, one of the largest empires in African history. The city of Timbuktu became prominent during this period as an urban center, and its educational institutions became well known. In the end, the Songhai Empire was defeated by Moroccan Berber forces that splintered the empire into many smaller kingdoms and ethnic clans. South of the empires of the Niger River were coastal kingdoms, including the Ashanti and the Dahomey, which flourished during the colonial era. The local African groups had to contend with the colonial European traders and invaders, which had superior weapons and different technology. Besides the mining resources of gold copper, salt, and ivory, the slave trade was a driving force that attracted trade ships from various European countries. The Ashanti Empire was located along the Atlantic coast in an inland region of what is now Ghana and Ivory Coast; this area served as a trading corridor where goods from the northern regions crossed to make their way to the coastal trading towns. The Ashanti Empire took advantage of the trade opportunities and became wealthy. By the time the Europeans arrived, Ashanti trade relationships were well established and capable of supplying the colonial ships with slaves, ivory, and gold. The coastal area of Ghana was known as the Gold Coast during colonial times. Similarly, the country of Ivory Coast (Côte d’Ivoire) got its name from its participation in the elephant ivory trade. The Ashanti were known for their involvement in the slave trade and today must live with that legacy. This region of West Africa bordering the Atlantic was called the Slave Coast because of the high number of local people from this area who were sold into the European slave trade and shipped to the Americas. The once powerful Kingdom of Dahomey, east of the Ashanti Empire, was heavily involved in the slave trade. Slave trading with Europeans brought them rifles and other firearms that were useful in conflicts with their regional adversaries. A major slave state along the Slave Coast, the kingdom attracted the spite of its neighbors as a pariah state for selling its war captives into transatlantic slavery rather than killing them, as was the custom in warfare. The Kingdom of Dahomey became the country of Benin after the colonial era. The slave trade brought wealth to many of the slave-trading kingdoms on the African coast. The demand for slaves pushed many of the African kingdoms to expand their slave-trading activities, capturing more individuals whom they could sell to European slave traders. Millions of Africans were captured by other Africans only to be sold into slavery, placed on ships, and sent to slave owners in the Americas. The total number sold into the Atlantic slave trade will never be known, but estimates range somewhere between ten and twelve million. Slaves kept for shipment were held in dungeons awaiting the arrival of the slave ships. 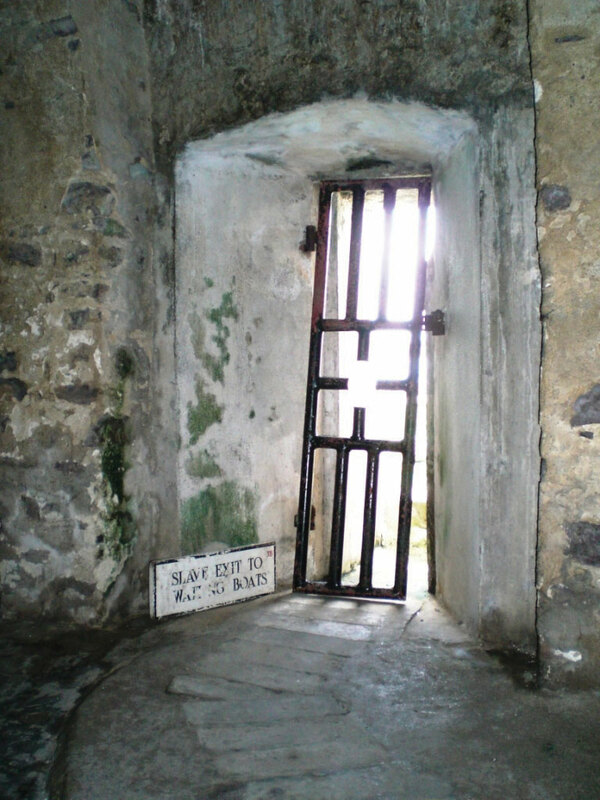 This was the last doorway that slaves from Elmina, Ghana, saw on their way from the dungeon to the slave ship. States and kingdoms existed throughout Subsaharan Africa. Early kingdoms flourished in the region that is now Ethiopia. East Africa’s Axum Empire was an example of the powers of the early African savanna kingdoms located in the east. The struggles between Islam and Christianity divided the region and gave way to the African Transition Zone, which serves as the dividing line between the two religions. Ethiopia has retained its Christian heritage, while to the north and east Islam has prevailed. South of the equator, the ruins of Great Zimbabwe give testimony to the regional base of power that existed there in centuries past. The Zulu Empire thrived in the nineteenth century in the region that is now South Africa. Wherever you go in the world, you cannot escape the impact of European colonialism. Subsaharan Africa was broadly affected by colonial activities, the legacy of which can be recognized to this day. Colonial powers of Europe ventured into Africa to claim colonies. In the discussion on Brazil in Chapter 6 "South America", Section 6.3 "Brazil", there is segment on slavery and the Trade Triangle of the North Atlantic. Slavery impacted Africa in other ways. Many African groups were instrumental in capturing and holding slaves to trade with the European merchants. These groups still exist and have had to live with the fallout of their role in the supply side of the slave trade. By 1900, European colonial powers claimed most of Africa. Only the Kingdom of Ethiopia and the area of Liberia, which was established as a home for freed slaves, remained independent. In 1884, Otto von Bismarck of Germany hosted the Berlin ConferenceMeeting called in 1884 by Otto Von Bismarck of Germany with the purpose of dividing and organizing African colonies by European colonial powers. The people who attended were European and American; Africans were not invited., which to a great degree determined how Africa was colonized. This conference included fourteen colonial European countries and the United States, and its purpose was to divide Africa and agree on colonial boundary lines. Germany had few claims in Africa; Bismarck was hoping to benefit by playing the other countries against each other. At the time, more than 80 percent of Africa remained free of colonial control. On a large map of Africa, claims were argued over and boundary lines were drawn according to European agreements. There was little regard for the concerns of local ethnic groups. Colonial boundaries divided close-knit communities into separate colonies. Ethnic boundaries were disregarded. Often-warring groups were placed together in the same colony. The Europeans, seeking profits from cheap labor and resources, did not consider the local people or culture and often employed brutal measures to subdue the local people. 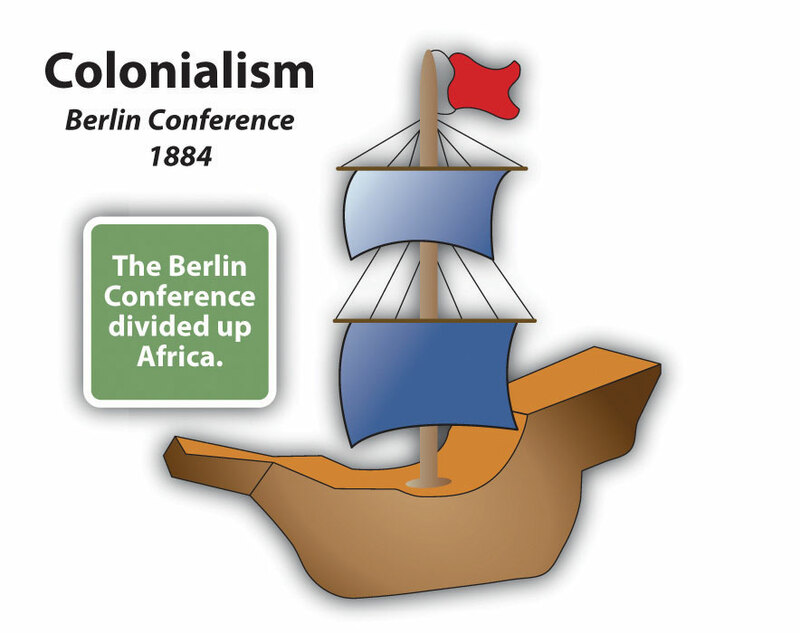 Most of the current borders in Africa are a result of the Berlin Conference, and many of the geopolitical issues that confront Africa today can be traced back to this event specifically and to colonialism in general. European colonialism remained strong in Africa until the end of World War II, which left many European countries economically exhausted. In 1945, the United Nations (UN) was established. One of the primary UN objectives was to oversee the decolonization of European colonies. Still, colonialism in Subsaharan Africa lingered on. It was not until the 1990s that the last colony was finally freed. The transition from colony to independent nation itself caused conflict. Civil wars were fought over who would control the country after the Europeans were pushed out. The transition to full independence has exacted a heavy toll from African countries but has resulted in stronger political structures and greater democratic liberties in many cases. The first country to gain independence in Subsaharan Africa was Ghana in 1957. During the era of independence after World War II, the Cold War between the United States and the Soviet Union enticed many of the African countries to support one or the other of the superpowers. The political pressure that divided African countries during the Cold War has persisted and is the basis of some of the current political problems. The European countries extracted raw materials and minerals from their African colonies, as well as slave labor. Varying degrees of attention were given to education, medical care, or infrastructure development. The dependency that a colony had had on a European country for economic income in some cases continued long after independence and may still continue today. On the other hand, major technology transfers from Europe to Africa infused greater efficiencies into Africa’s economic activities. The imperial nature of colonialism and the divisive Cold War did bring about, in an unfortunate manner, the benefits of structured governments and greater democratic processes for many of the local areas of the realm. 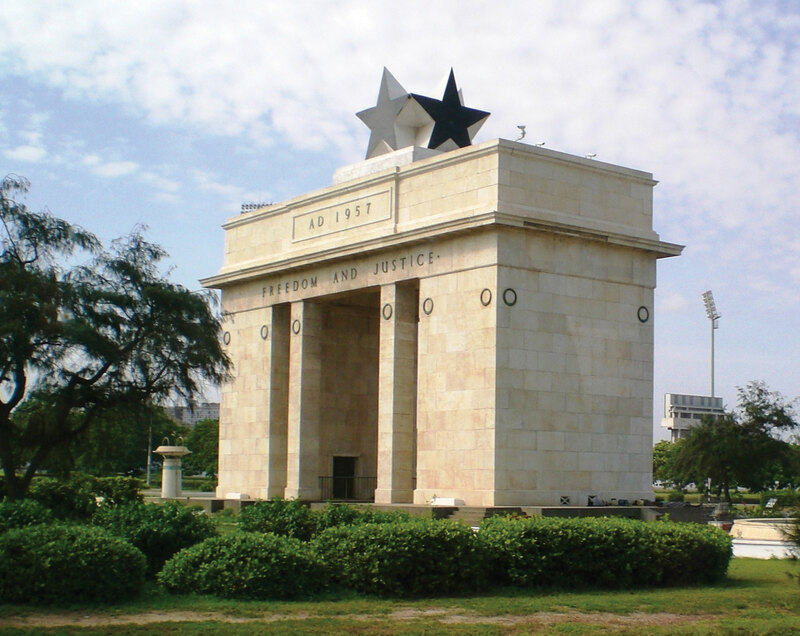 This monument honors Ghana’s independence in 1957 from the British. Ghana was the first country in Subsaharan Africa to gain independence. The transition from European colony to independent state has not necessarily been a civil transition for African countries; likewise, independent African countries have struggled to create stable governments or peaceful conditions—though stable governments and peaceful conditions have been established in some cases. In nearly all cases, removing the colonial powers from Africa was only half the battle toward independence. The other half was establishing a functional, effective government. Though each country has taken a slightly different path, most former colonies have endured civil unrest, conflict, or warfare in their push for stable governments. Coups, fraudulent elections, military regimes, and corruption have plagued the leadership in a number of African countries. Civil unrest usually precedes a change in leadership: political power regularly changes hands by a military coup or an overthrow of the current leader. The realm has had difficulty developing and maintaining effective political systems with democratic leadership. Political leaders have come and gone, many have been replaced before their terms were over, and a few have stayed long after their terms ended. When a leader is elected democratically, it is common to have widespread accusations of corruption, voter fraud, or ballot box scandals. Such government mismanagement and corruption have been common problems. The vacuum left by retreating colonial powers at times has been filled by authoritarian dictators or by leaders who assumed control of the government and then proceeded to pillage and plunder the state for personal gain or for the enrichment of their clan or political cronies. After the colonial era, it was not uncommon for new leaders to be connected to the old colonial power and to adopt the language and business arrangements of the European colonizer. This gave them an advantage over their competitors and provided a means of income gained by the support of their former European colonial business partners, which often wanted to keep ties with their colonies to continue to exploit their resources for economic profits. Many of these leaders stayed in power because of military backing or authoritarian rule funded by the profits from selling minerals or resources to their former colonial masters. A few countries are still struggling to bring about some type of order and unity, and in spite of all the negative issues, there have been democratic and relatively stable progressive governments in Africa that have emerged from the transition in recent years, which is a hopeful trend for the long term. It is important to note that the objective of colonialism was to connect a colony with the mother country, not to connect African countries to each other. As a result, little cooperation occurs between African countries. Each individual country interacts more with its European colonial counterpart with regard to trade, economics, and cultural dynamics. European colonialism has isolated African countries from their neighboring countries and does not contribute to unity within or among African regions. Colonial powers often built new port cities to extract goods and resources from their colonies and transportation systems from the new ports to the interior to collect the resources and bring them to the port. However, the colonial powers did not build a network of transportation systems that connected the region as a whole. Colonial powers were intent on continuing dependence on the mother country so their colonies could be controlled and dominated. The current wave of globalization based on corporate colonialism continues to encourage the same pattern of discouraging interaction between counties and instead encouraging trade with more economically powerful non-African countries. Most of the interaction between countries is a result of crisis or warfare, in which case large numbers of refugees cross the border into neighboring countries for personal survival or security. To begin to work together and promote trade, common transportation, security, and industry, fifteen West African states came together in 1975 to create the Economic Community of West African States (ECOWAS)Agreements in 1975 between fifteen West African states to begin to work together and promote trade, common transportation, security, and industry.. Since then, additional political and economic agreements have been signed by various African countries. In 2001, the more expansive African UnionAgreements in 2001 between African states to form a united body to focus on issues within the African continent. was created to help African states compete in the international marketplace. Subsaharan Africa includes the African Transition Zone and the regions south of the Sahara. The African Transition Zone is a transitional zone between type A and type B climates and between the religions of Islam and Christianity. Subsaharan Africa is a realm of plateaus and basins with four main river systems. Mountain ranges, volcanic peaks, and large lakes are found in or along the rift valleys of eastern Africa. The rift valleys were created by tectonic activity. Before the colonial era, many African kingdoms dominated regions of Subsaharan Africa. West Africa had a number of great kingdoms. Kingdoms along the coast contributed to the slave trade. European countries colonized almost the entire realm of Subsaharan Africa. 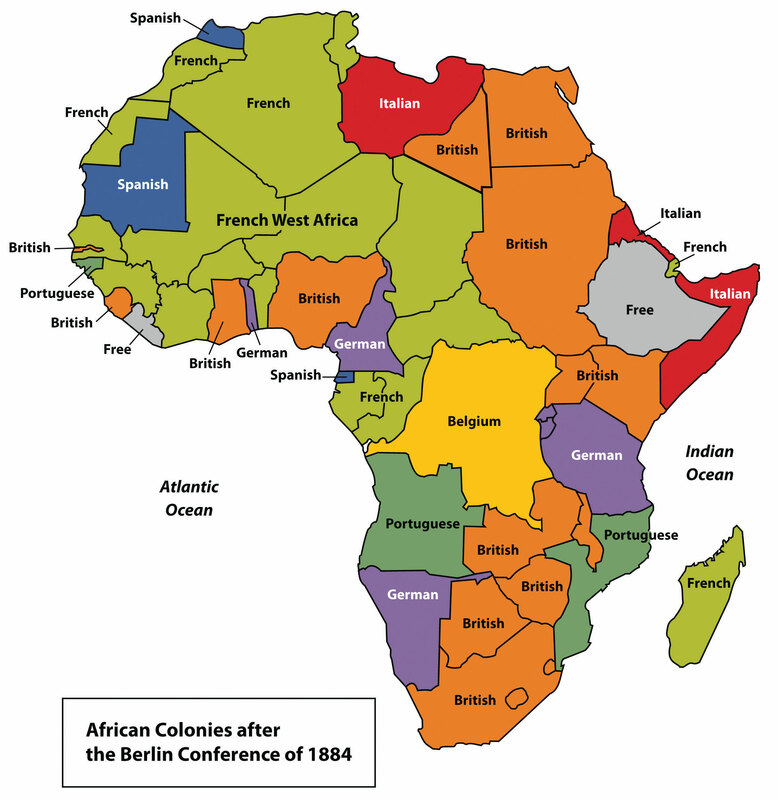 European powers made agreements during the 1884 Berlin Conference to divide the realm and create boundary lines between their African colonies. Many of the lines remain as the current borders today. Colonies were designed to provide labor and resources to the mother country. Port cities, transportation systems, and other infrastructure were implemented to benefit the imperial power without regard for development of the colony. African colonies received independence after World War II. The transition from colonies to independent countries has been plagued by civil war, political chaos, or economic devastation. What are the main boundaries that define Subsaharan Africa? Where is the African Transition Zone? What are the main transitions that this zone represents? What geological phenomenon has created the rift valleys of the east? What physical geographic features are found here? What are some of the general environmental issues that can be found throughout the realm of Subsaharan Africa? Name the African kingdoms that were involved in the supply of humans for the European slave trade. How did imperial powers in Africa cultivate their colonies’ dependence on the mother countries? When did the colonies in Subsaharan Africa gain their independence? What has been the usual pattern of transition from colonies to independent countries? What country was the first in Subsaharan Africa to gain its independence? In what year did it gain independence? How are the Subsaharan African countries continually isolated from their neighbors in the global economy? Determine which of the countries in Subsaharan Africa are now experiencing civil war or national unrest over political leadership. Determine which countries of the realm have the most stable governments.